Have fun handing out candy tonight! I miss the days of trick-or-treating too! I wish I could at least hand out candy, but that's dorm life for ya. I think I'm going to do some creepy make-up and go get dinner at the dining hall with my friend and watch DWTS. Happy Halloween! Yeah that's one thing that isn't fun about the dorms on Halloween! That still sounds like a fun night though, so enjoy and happy halloween!! Yay! And I definitely agree, there's never such a thing as too many boots! I got some super cute booties this season and I love my hunters!! I think I need to treat myself to one over the knee boots now! I still don't have a pair of Hunters, but I've been wanting them for so long! I like the blush booties. They're my fave! Those are one of my favorites too, blush is such a great color! Thank you! And yeah I have a few suede boots as well that have to get put away during the wet weather! Will definitely be buying some more weather proof boots like those hunters! I am a complete boot fan. This is one of my favorite parts of the cooler weather. 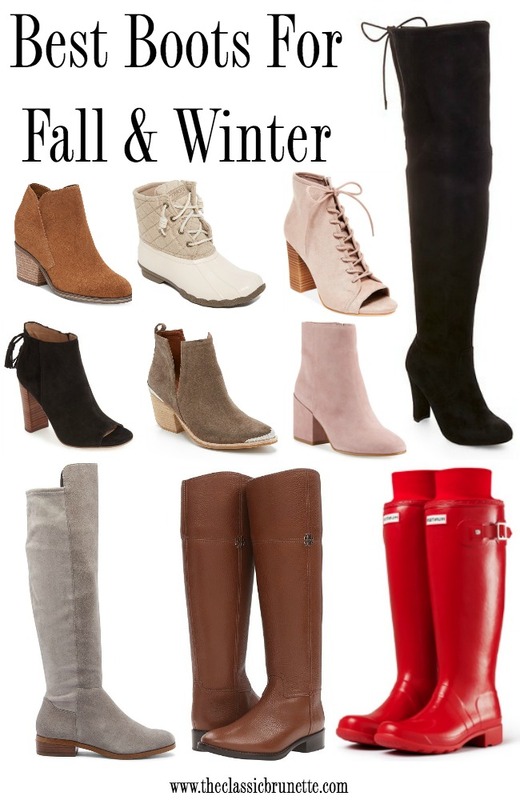 Personally, I love the knee high styles but also invested in a couple pairs of booties this year. I am planning to get one more pair and haven't decided on a style yet. Booties are probably my fave since I wear them so often, but tall boots always make an outfit look more put together! Those black over the knee boots are phenomenal! They look like they'll be perfect for Fall and Winter! Love these picks so much! On point! I need those mid-calf suede boots. Great round up! Those blush booties are gorgeous!! I always love a good colorful hunter boot! Same here! They're so fun! LOVE these picks! Fall boots are my fave! Thank you! Boots are the best! Ok I seriously love all of these picks!! Trying not to urge the need to purchase a few, but it looks like I'll need to now! I need all these ankle boots! Way too cute! I can't wait to pull out my knee high boots! LOVE the over the knee boot trend! Such a gorgeous and effortless way to dress up a casual outfit! Love those black OTK boots! I've been looking for a pair just like that! Thank you! I love them too! And they're an AMAZING price! I love your picks! We ended up staying home to hand out candy. It was raining, and fortunately my son didn't care about going out trick-or-treating in the rain. We didn't get many trick-or-treaters, though, so we're stuck with lots of leftover candy! I'm really getting close to pulling the trigger on some black OTK boots and this pick is definitely going on my list of maybe's. Thanks! Happy Halloween and hope you feel 100% soon! You won't regret it, they're so cute!! And thank you! I love all your picks, and I've always wanted to get a pair! The weather here is summer all year long though, so I don't know if that'll be the best idea. Gorgeous picks! Thank you! And yeah I understand the year long summer, SoCal is always pretty warm!! Love those olive booties! I also spent Halloween night catching up, yay for being an adult! These are all SO cute! I actually just grabbed those exact Tory riding boots - they're on sale on her website today!! SO cute and the sale price is so exciting haha! These are all great picks! I recently got a pair of over the knee boots that I'm obsessed with! One of my favorite parts of fall and winter is wearing boots! I can't get enough. That blush pair has my name written all over them. I love the red rain boots! I've wanted a pair for so long! I love those Tory boots and the Hunters! The red is so awesome. These are all such great picks! Oh how I miss America and the seasons! Summer all the time is SO boring!! I LIVED in my red Hunters during the winter because they were cute and snow-proof without looking like my ugly big snow boots! Can I please have all of these boots?! They're so cute!! I have been wanting a new pair of riding boots!